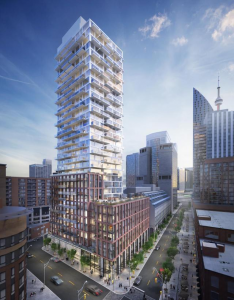 When people are searching online for a downtown Toronto condominium, they are looking for a great listing comprising an appropriate list of amenities that will best suit their lifestyle. Of the 54% of Torontonians who cycle either recreationally or as a means of transportation, finding condos that are cycle-friendly is becoming more of the trend. Will the condo communities set to become more bicycle-friendly see their properties increase in value? While there have been some studies that have found some correlation, it can be tough to determine. The city of Toronto has seen a growing trend in its active cyclists, so it’s safe to assume that more of the city’s residents will be seeking neighbourhoods that will accommodate their cycling needs. Is your Toronto Neighbourhood Bike Friendly? 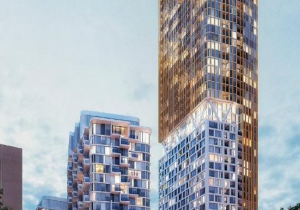 Toronto condo developments that can accommodate safe bike storage, are in close proximity to bike share racks, and feature major bicycle lanes and recreational trails are more likely to catch the a member of the Toronto’s growing cycling communities eye. 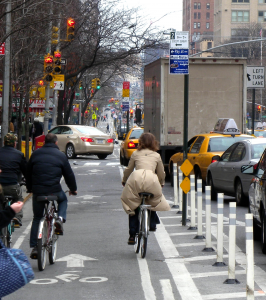 Along with high transit and walkscores, condo communities with higher bikescores are becoming more sought after as the city’s bike infrastructure continues to increase year over year. A great bikescore is attributed to bike lane access, the amount of hill’s, amount of destinations and road connectivity as well as bike commuting mode share. Voted as one of Canada’s best biking communities is the Toronto Studio district as it offers great access to the city along the Lakeshore. – With over 17,000 post-and-ring- bicycle racks installed since 2001, Toronto has become the leader in North America. – Of the 54% of Torontonian cyclists, roughly 25% primarily cycle for recreational purposes and 29% cycle regularly for transportation. – On a typical weekday between 7am and 7pm roughly over 20,000 cyclists will enter the downtown core. For individuals and families there are many recreational bike trails to enjoy in Toronto. BlogTO recently compiled a list of all the city’s best bike paths. Areas like the Toronto Beaches, along the Humber Valley and the lower Don Valley trails allow for a nice ride with beautiful scenery and views of Lake Ontario. 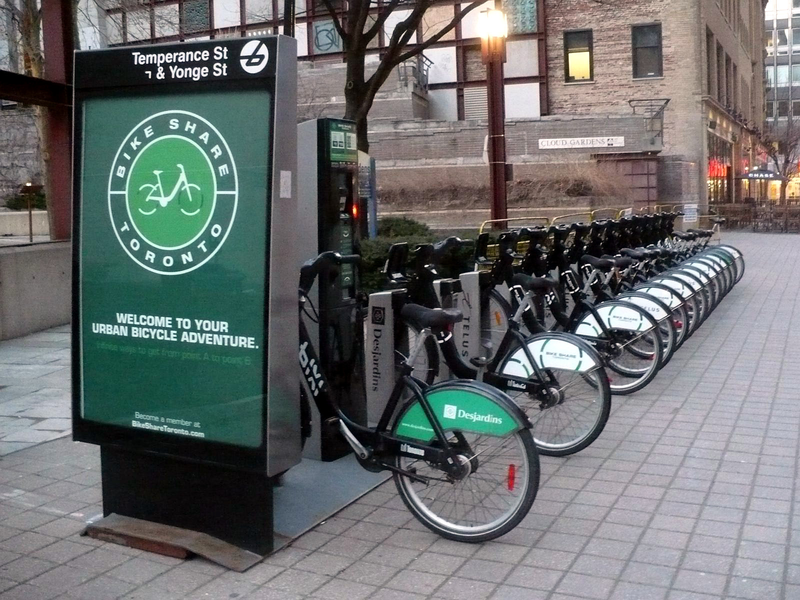 For $90 a year or just under $20 a month, members of Bike Share Toronto have access to over 1000 bicycles and 80 docking stations in Toronto’s downtown core. The programs increasing popularity among Toronto residents and overall success has lead the Ontario Government to invest 4.9 million dollars in 2016 in attempts to double the scale of the service. 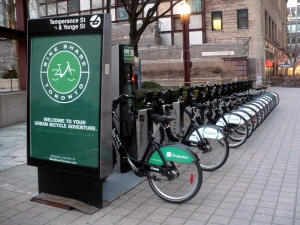 According to a recent study from McGill University, residential units in Montreal have increased in value since they have been made closer to a Bike share station. In the study they found that inclusion on bike racks correlated with the value of a typical home increasing by 2.7 percent. Anyone would agree that riding your bicycle to work is a great way to save money, stay fit, lessen the impact on the environment and most likely outpace the slow 501 Toronto streetcar on any given day. That being said, you won’t be able to sell every Torontonian on commuting to their downtown office. In fact there are only around 1.7% of Torontonians brave enough to commute by bicycle in the busy traffic. With the heavy amount of traffic in the downtown core, dangerous streetcar tracks and some negligent drivers and pedestrians, the rest of the population is content in driving or taking the TTC to their work. With the growing demand for better cycling routes and the current negative perception of safety involved in Toronto cycling has lead the city of Toronto is investing in a 10 year plan to connect, regrow and revitalize Toronto’s cycling network. The plan looks to implement the following upgrades to the cities growing bicycle infrastructure. – a 90 centreline km of cycling routes along quieter streets. 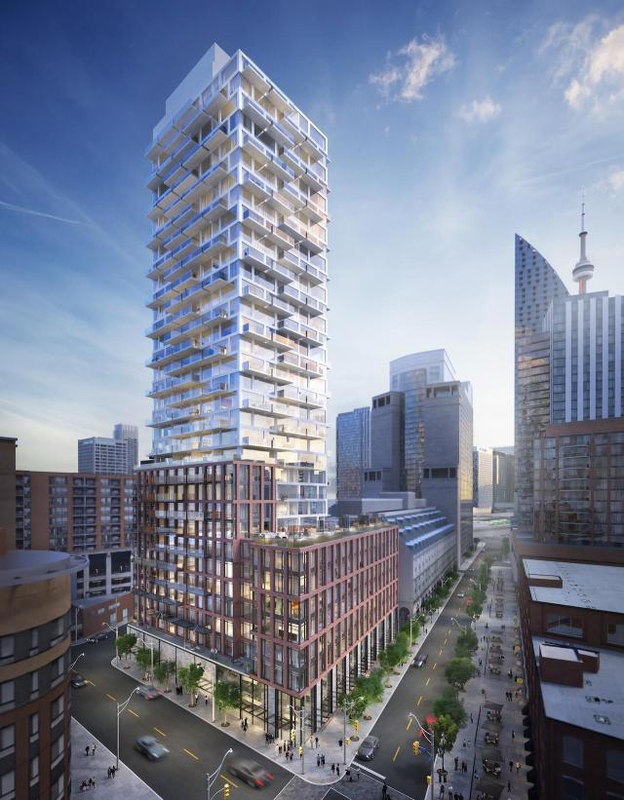 Which Condo Developments Will See Interest from Toronto’s Cycling Community? When looking to make an your next Toronto condo investment, paying attention to the updates to the city’s bike infrastructure and the changing Toronto cyclist map can be essential in targeting the growing demographic of Toronto cyclists. A good practice is to find the areas set to gain certain upgrades and look for condos in that areas using the interactive condo listing map provided by TalkCondo.com. This is the best course to find condo developments primed take advantage of the Toronto citizens increasing demand to live in a bicycle friendly neighbourhood. With its close proximity to the Leslie Street spit that connects to Toronto Island, residents of this upcoming condo project will have access to some of the best city cycling in the country. A few strides on the bike will carry you down to the beautiful Rosedale Valley Pathway. This path takes you on a decline that ends at the Don Valley River that sports a beautiful view of the city. 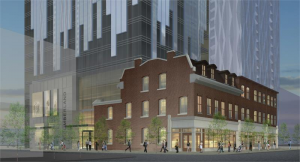 8 Cumberland Condos is located in the heart of Yorkville. Artists’ Alley Condo’s, while located in the heart of the Downtown Core, can take advantage of a relatively quiet and smooth biking experience down Beverly Street. No matter where you are, you are close to the lake and the Martin Goodman Trail, Queens Park, Trinity Bellwoods and all the beautiful areas hidden in Toronto’s Downtown Core.